Obsidian Glass is an important material used for upgrades in Assassin's Creed: Odyssey. In Assassin’s Creed: Odyssey, one material players have been wondering how to get is Obsidian Glass. Because of its rarity, it can be challenging to gather enough Obsidian Glass to upgrade items in your inventory. If you’ve been struggling to find Obsidian Glass in Assassin’s Creed: Odyssey, we’ve got you covered. Below, we’ve put together a quick guide on how to get Obsidian Glass in Assassin’s Creed: Odyssey. One way to get Obsidian Glass is by raiding forts in Assassin's Creed: Odyssey. Assassin’s Creed: Odyssey tasks you with collecting a variety of materials in order to upgrade your gear from Soft Leather to Olive Wood to Obsidian Glass. Among the rarer crafting materials, it can be hard (though not impossible) to find Obsidian Glass. So, where do you get Obsidian Glass in Assassin’s Creed: Odyssey? One way we like to get Obsidian Glass is by breaking into fortresses. By finding and clearing out forts in Assassin’s Creed: Odyssey, you can earn a plentiful amount of valuable loot, including Obsidian Glass. Additionally, you can break down items you already own and no longer want to add more Obsidian Glass to your inventory. While this isn’t the most reliable way to get Obsidian Glass, it’s definitely viable if you’re planning to trade in one item for a better one. For a visual example, check out YouTuber Assassins Bleed AC Walkthroughs Cutscenes as they dismantle purple items for Obsidian Glass. Another way to boost your supply of Obsidian Glass is by seeking out Nation Chests. To do this, open up your map and scan the area around you. In doing so, you should be able to view where Nation Chests are, as their general locations are marked. When you arrive at these locations, you can use Ikaros to pinpoint the exact spots where these Nation Chests are. In general, Ikaros is a great tool that’ll help you avoid needlessly searching for things like Nation Chests. Note that not all Nation Chests will drop Obsidian Glass, though they’re still worth hunting down if you have the time. Finally, you can purchase Obsidian Glass from vendors in a pinch. While most players will be reluctant to spend their hard-earned Drachmae on materials like Obsidian Glass, it can often be the quickest way to upgrade your gear. 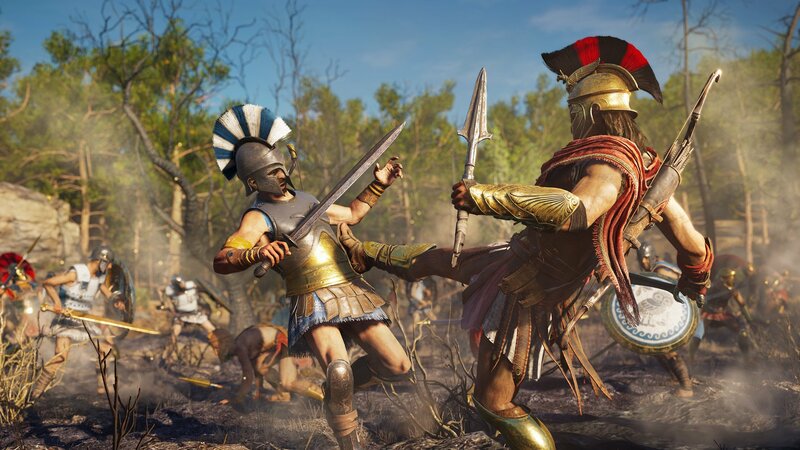 With upgraded gear, you’ll have an easier time gaining XP and leveling up your character (Kassandra or Alexios) which will help when running through quests like hunting down members of the Eyes of Kosmos. What’s your favorite way to get Obsidian Glass in Assassin’s Creed: Odyssey? Let us know down in the comments below! For more on Assassin’s Creed: Odyssey, be sure to check out some of our previous guides including how to open the Cave of the Forgotten Isle in Assassin’s Creed: Odyssey, where to find the Arena in Assassin’s Creed: Odyssey, and how to pass time by waiting in Assassin’s Creed: Odyssey. By reading through this guide, you should now know where to get Obsidian Glass in Assassin’s Creed: Odyssey.